Was rather lazy after two late nights in a row (admittedly last night's 12.30 was rather better than Friday's 3am…) and didn't get going very early. Finally dragged myself out to the allotment after lunch and had a really good afternoon making the best of the still gorgeous weather. 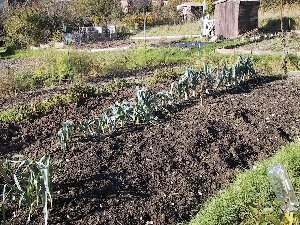 I now have managed to dig all of the major plots and have cleared the lettuces and most of the weeds round the leeks. The garlic is planted under and in a thick layer of leaf mould, I've ordered some manure after seeing a delivery arrive for someone else (and chasing after the tractor!) and I've had a pitched battle with the blackberry briars. I think I won in the end; they are now rather smaller than they were and tied in pretty well. All that is left is to clear where the French beans are, which I've deliberately left as a boundary marker up to now. Had a chat with Jim and so found that even if the pods are still green it's ok to pick the beans and use the seeds next year, as long as I dry them out thoroughly. Frost is forecast now for Thursday on the farming weather. After managing to miss the phonecalls from the farmer all morning, got my manure delivery. Got 10 minutes' warning and had to peg it over to the allotment. The trauma of getting it will I'm sure be funny one day, but… the geometry of the access road to the allotments, and the slope down meant the tractor's trailer had to tip it out diagonally so most went on the path between plots rather than in the compost heap area. Photo was taken after about 5 minutes of shovelling. The stuff's *heavy*. The path's there somewhere. After 30 mins of exhausting shovelling I called P for help. He managed even less than me but between us and me getting my second wind, we cleared most to where it was supposed to be. At the last, I dug a path through to the access road and put a board on top of it, having uncovered the buried railway sleeper. Still a huge pile in the way, though, and some in the next plot... It would have helped if I hadn't received roughly twice the amount I wanted!!! Next time I wear full wellies and not just welly shoes... But at least it means the soft fruit will be metaphorically in heaven next season. The rhubarb especially. Pity I don't like it! The actual manure is not quite as rotted as it should be, but on the way. I hope next door wants some, as he's got it… right in his compost heap!!! 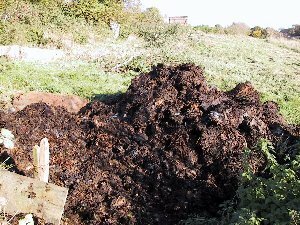 One large heap of not-terribly well rotted manure! The crocus.co.uk website mentions that manure takes just a couple of months to reduce down from the fresh strawy state to better condition stuff, so I think that will be my timescale, as it's already partially rotted but it's late in the season. Some was steaming but most has got past that stage so should be on the verge of being usable. A day at home at last and not raining at that, so went up to the A and finished off shovelling the cow manure into one large pile, not on the path or next door's plot. Interspersed this with pruning the blackcurrants, though I realised I was getting more ruthless the more I did… A lot of wood was dead, so just putting a wellie on it was enough to remove it. Then it was a case of identifying which bits were old and which new. The annoying bit was that most was older, brown wood and the tea-coloured wood was not as it should be from the bottom but just sprouting from the top of the brown wood. The black wood was under that so according to the book, these hadn't been pruned properly for some time. Cut out all branches that were rubbing on others, and quite a few other bits, like those in the way of the route through the patch, and the really black branches. Still have the tops of the branches in place, though next door has pruned his down the stems. I will probably do this before bud burst, but right now I'm happy to just get the bushes reshaped. And there are some new shoots from the very bottom in some of the bushes. I didn't even try the witchfingery gooseberry! Plant report: leeks still happily growing, though have pulled all the really big ones now. Onions coming up nicely (though the earth where they are has gone a moss green colour - chicken manure effect?) and much to my surprise the garlic's up already, with several inch long shoots. Cut more broccoli and a couple of leeks, but not the poor cauli as it's been badly frosted and has gone brown. Should have cut it last time or bent the leaves over it, so my fault. But the spring cabbages are still alive (or uneaten) and seem to be growing more leaves. They are incredibly tiny, but hanging in there nicely. I can hope! Still feeling achey so couldn't do much, but did pay a visit to the allot to see what was happening. Something's bitten the leaves off a couple of garlics and the onions are looking a bit sorry for themselves, but then again it was -4oC last night. Spent a few minutes talking to a robin that was sitting in the Bramley watching me. Glad about that. Christmas dinner for Mum and Dad. Beans, marrow (made it to Christmas unspoiled! ), potatoes, carrots and the onions in the stuffing all mine :-) Very frosty. Real Christmas dinner, and again all my veg :-) Very satisfying!